I've followed Kat and her business on Instagram for months now, and am always so damn motivated by her ability to view health and wellness in such a positive and healthy light. She's one of those people who uses her social influence to truly better the lives of others, and that is something we can get behind 100%. 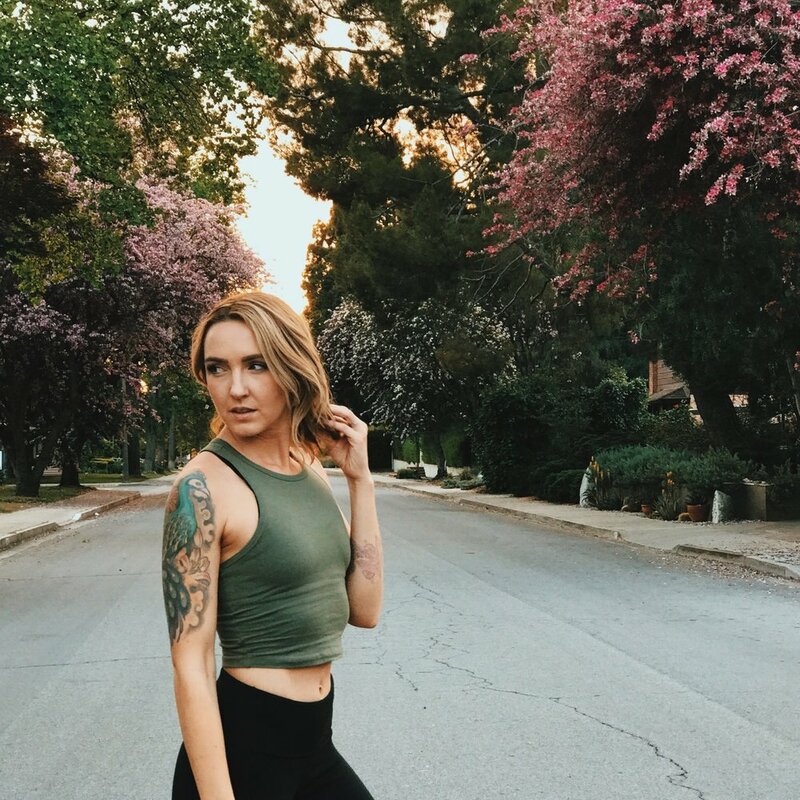 Her story is one for the books, and we were so stoked to pick her brain about her incredible journey with Keep Going Kat. Thanks for chatting with us, girl. You're a total babe. I pretty much admire any woman going after her goals. One of my biggest inspirations is Jillian Michaels - she's basically America's personal trainer. I love how true she stays true to herself and I hope to one day have the influence she does. I also admire Katie Willcox, owner of Healthy Is The New Skinny. She has made such amazing progress in creating a conversation about media influence on body image and self esteem. I had the opportunity to work with her a few months ago, and it was truly a life-changing experience. My family loves to take getaways to Palm Springs, eat sushi and visit local craft breweries. I am blessed to have most of my family nearby, and I love cooking family meals and having BBQs. The work/life line is pretty blurred for me in my role online; even during “free time,” I find myself banking content, taking photos and creating outlines for new blog posts. Some of the best content is created during natural moments as opposed to staged ones. My favorite app of the moment is Planoly. It has been a huge help for organizing and planning out my feed. You can enter and schedule posts and captions ahead of time, which allows you to see how your feeds will populate and lay out. A quad Americano with coconut milk. I have an espresso machine at home and I take pride in my morning coffee ritual. Plus, after 5+ years as a barista, I can make a mean Americano. I love a good IPA. After having my son while starting my business, I worked in a tasting room at a craft brewery to make ends meet. Craft beer is an amazing way to generate local economy, plus it’s delicious! I love following Richelle Davis. She keeps it so real and her photos are beautiful. Is it cheesy to say Oprah? I think she is such a guru and would have so many gems to pass along. I would love to just spend a few minutes in her greatness. Honestly, I love where I am. It's pretty crazy to actually say that, because I remember in my early twenties feeling like I wanted to run far away. I think the more comfortable I become with myself, the less I feel like being anywhere else. As they say, "the grass is greener where you water it." What's one thing you wish you knew more about? Finance. As an accidental business owner, I find myself playing catch-up on learning the ropes. I have been singing semi-professionally and competitively since I was seven. I received a full ride scholarship to San Francisco Music Conservatory for Opera, but I didn't attend because my mom was sick at the time. I am a NASM-certified personal trainer, bootcamp instructor, blogger, social media influencer and entrepreneur. I started my Instagram account, Keep Going Kat in 2013 after having my son. It was a way for me to share my journey of working out completely from home. I lost 65 pounds with no equipment. We couldn't afford much at the time, so cooking from home was a necessity and doing my workouts from home was my only option. After a year of sharing my progress, my account grew immensely. I wanted to show people you don't need anything but your body to work out, and eating healthy doesn't have to be expensive. I then became a certified personal trainer and began teaching free Saturday morning bootcamps at my house. I haven't stopped since! My alarm goes off around 5:30 or 6 each morning, and I answer client emails while I start my coffee. While eating breakfast, I post and moderate my Facebook groups and sometimes do a live broadcast depending on the day. My first client comes to my house around 8am every day, and I have a workout area set up in my home. I generally train 4-6 clients on weekday mornings. After morning sessions, I hit the gym for my 35 minute session. I spend the remainder of the day writing workout plans, editing workout videos, working on sponsored content and creating content. My husband takes every photo I'm in, and films all of my workout videos. I handle the rest! How has fitness evolved from the role you originally thought it would play in your life? It all started with Instagram. I created KGK as a way to document my fitness journey, and I found it so motivating to share my progress. As my following grew, I started to receive a ton of questions. I decided to get my NASM personal training certification shortly after, and realized pretty quickly that I didn't want to take the 'normal' route in fitness. Most trainers I know work very long hours, and are required to follow gym policies such as weighing their clients each session. I take a very different approach with my clients. I want them to focus on improving athletically, not aesthetically. If you are challenged during your workout, your body will change. Where did you get the idea for your Bootcamps? What is it like working so closely with people and their health and body image? I started to have friends and family ask to do workouts with me in the beginning. I decided the easiest way would be by starting a free Saturday workout that all would be welcome to. Nearly 15 people showed up for my first class, and we made plans to do it again the following week. Now, my bootcamp yields 30+ weekly attendees. As far as working with clients, my focus is never on how the clients look, but how they feel. I focus on whether they're more energized, stronger, and less depressed or anxious. I try to take the focus off appearance and focus more on the benefits reaped from getting in shape. I work from home, which comes with a lot of flexibility, and my four-year-old son provides lots of cute distractions. I do the majority of my work in leggings while sitting at my kitchen table. Would you say there was anything from your previous work experience or education that prepared you for running your blog and business? This is something I discuss with my husband often. I spent the majority of my life on stage performing, which is something I draw from every time I lead a class or film a video. I pour a lot of energy into my in-person sessions. If I am not high-energy, the class won’t be either. How do approach self-promotion? Do you have any advice for Babes who struggle with having confidence to promote their work? Self promotion is KEY! If you aren’t promoting yourself, your clients won’t find you. The more true to myself I am, the easier I find it to promote myself. If you don’t believe in your content, no one will. I made learning about the marketing side of my business as important as my craft itself, and I am constantly listening to podcasts and reading blogs about entrepreneurship and marketing. Did you struggle at all with sharing your personal progress with such a large audience? Sharing my personal story with the masses has actually been a really healing and amazing experience. It is incredible to share and be vulnerable, and then have others reach back out and say they feel the same. With such a digital-focused business, how do you ensure you get enough off-screen time? The more content I plan ahead of time, the less time I spend on my phone trying to figure out what to post next. I also try to be intentional with my social media time. Instead of aimlessly scrolling, I am engaging with my active followers, and I rarely spend time on Instagram that isn’t business-focused. I also schedule feed time like a task, restricting time spent to 40 minutes tops. As a female entrepreneur that creates content specifically for women, I would say it affects every aspect! My goal is to empower women in the health and fitness journey by providing the information they need to do it themselves from home. Often as a blogger, I have people who are confused about the logistics of my work. I think my mother-in-law thought I had an online shopping problem because of the amount of parcels and packages I receive in the mail. The most common question I receive is “how do you make money?” The terms “content creation” and “influencer” are fairly new terms to a lot of people. I find myself explaining often how I negotiate my rates, the guidelines of the FTC, and details of how brands go about finding me. Balance. I could easily work 15 hours a day. I open my eyes and start thinking about work and my to do list. I am making an effort to keep more regular business hours. One of the biggest obstacles I've faced is self-doubt, and sometimes I feel like I'm faking it. I had a moment when I was attending the espnW Women + Sports Summit where I sat amongst professional athletes, olympians and sports broadcasters and kept thinking “I don’t belong here”. As I sat and listened to Jessica Mendoza speak about how she became the first female broadcaster in the booth for ESPN's College World Series coverage and also asked herself where she belonged at times, and I had a revelation. In some way, we all feel like we're faking it, but It’s up to us to follow through despite the doubt. What is your advice/encouragement for women who want to take the first steps toward living a healthier life, but might be too intimidated? When I first started my fitness journey, I could not do a single push-up. I had zero upper body strength and hated every minute of my workouts. I had to push past the feeling of “I can’t” to see what I really was capable of. Remember that being “fit” isn’t about being a certain size or number. It’s not about shredded abs or low body fat percentage. It’s about taking great care of yourself and putting your health and wellness goals first. YES! I find my biggest struggle to be with staying fresh and original while trying to stay true to my own unique voice and point of view. It’s easy to get caught up in what others are doing. I make it a priority to keep my head down and try to put out my distinct style of content. I utilize my fitness group often to get ideas for new content, and I am always asking what they're looking for. Their feedback inspires me to create content my followers really want and need. What makes Keep Going Kat stand out among other fitness brands/businesses? I think my non-conforming style is what draws people to KGK. I make it a point to speak openly about controversial subjects like “Fit Tea”, and waist training. I make it a point to keep it real at every opportunity. I never want people to think that I am perfect, because I'm far from it. I like to post the real stuff. My husband is a huge support system for me and my business. He is the definition of “Instgram husband.” He films my workout videos and takes the majority of my photos. There were many moments early on that I wanted to quit and he would always remind me “You are Keep Going Kat! You can’t quit!” His support has truly carried me. I am extremely self-motivated. Creating deadlines and task lists for myself and completing them gives me a rush. I love feeling on top of my game. I would love to do content creation for a magazine or large platform like Shape or Popsugar. My clients motivate and inspire me daily. Seeing their progress, getting their texts and watching them improve is why I do what I do. It never gets old hearing “you changed my life”. Success is about balance in my book. You are successful when you live to work not work to live. My workouts are my “me time.” Blasting music, focusing on breathing and just being in my physical primal self is SO soothing. I always come out of my workouts feeling less stressed. The funniest experiences generally come with being recognized and called “Keep Going Kat” in person. Recenlty at Trader Joes, a girl followed me through the store and put everything I put in my cart, into her own. When we reached the checkout she finally said “You're Keep Going Kat right? !” She showed me that she had selected everything I had, and we had a good laugh. I also LOVE seeing people doing my workouts in the gym. I walked into the aerobics room at my gym to see a girl performing a circuit I had posted the day before. It was so cool to see my workout in action. What’s next for you?/What are your goals for the future? My goal is to open a fitness studio locally. I want to create a space that is NOT a gym, but something that feels like its own thing. A place to improve, to grow and to find a healthy happy balance. I plan to do seminars, discussion panels and cooking classes on top of my workouts as well. Do you unapologetically. The world has enough copycats. Use your unique voice and stay as true to yourself as possible. All photos belong to Kat Maisano. Connect with Babes Who Hustle! Jun 26 I Worked Two Jobs to Fund My Dream Career. Here’s Why I’d Do It Again.